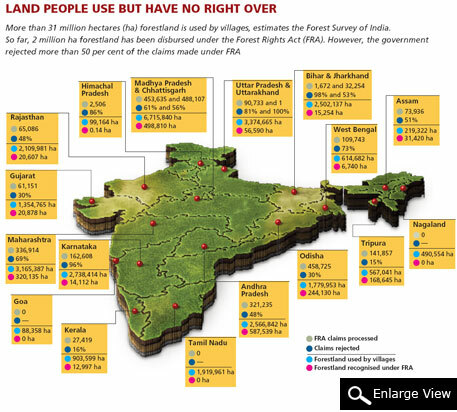 Over 1.3 million tribals and forest dwellers have got rights over the land they had been using for years under the Forest Rights Act. This can, in some way, be called contemporary India’s largest land regime change—from the forest administration to the rightful owners of forestland. The Act promises another bounty—access to government schemes. 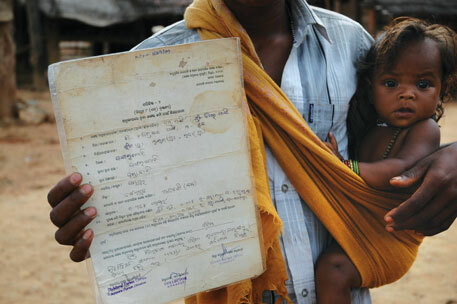 But six years after the Act was enforced, lives of the forest dwellers have not changed much. Not one state has initiated concrete steps to officially register the title holders in the state land records. Without this they remain what they used to be—officially non-existent. Owning a piece of the planet is overwhelming. 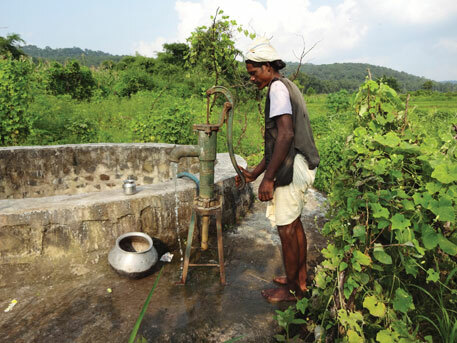 For Lange Manjhi, resident of Jurakhaman village in Odisha’s Kalahandi district, it is much more than that. He grew up in the forest village and cultivated the land he inherited from his father. But he had no legal right over it. Rather, he was called an encroacher. And an encroacher has no right over government’s development schemes. He cannot even sell his paddy to government agencies, forget about getting government loan to invest in his farm. So he felt liberated in June 2010 when the Odisha government recognised his land rights and gave him title certificates, or pattas, under the Forest Rights Act (FRA), 2006. That month, the state gave titles to 54 families over 146 hectares (ha) in Jurakhaman. Development has started to show in Jurakhaman. Its landscape speaks of the changes FRA has brought in. Of the 54 families, 24 got money from the government to build houses under the Indira Awaas Yojana. Under the horticulture department’s programme, many have mango trees in their farms, a future money earner. A new lift irrigation project irrigates 24 ha of 14 families. Under the Mahatma Gandhi National Rural Employment Guarantee Act (MGNREGA), people have developed their farms. “We hope the production will increase,” says Manjhi. “Earlier, we would sell rice to local traders at Rs 500-700 per quintal (100 kg) when government’s price was Rs 1,200 per quintal,” says Dhan Singh Manjhi, village leader. Government agencies such as Food Corporation of India-authorised markets or farmers’ cooperatives would not accept foodgrain from an “encroacher’s” farm. This year, Manjhi and Lange together sold 4,500 kg of rice for Rs 45,000 to government agencies, an unheard of income in the village. “Development work has been proposed for families which have not availed the benefits yet. An irrigation project is also in pipeline,” says Sunita Tandy of Kalahandi-based non-profit Seba Jagat, which works for tribal rights. 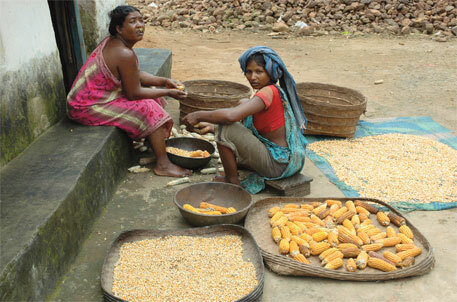 Like Jurakhaman, many villages in Odisha are showing signs of prosperity. 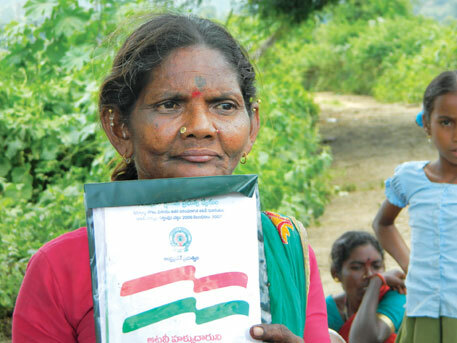 In Khariguda in Koraput district, 46 families got land titles. Of these, 16 constructed terraces on their farm slopes using MGNREGA. 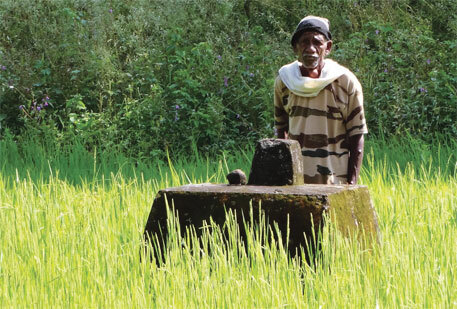 “My one acre (0.4 ha) farm will now fetch much more ragi,” says resident Bagh Mudli. This is the development potential of FRA. Till June this year, 1.3 million families across the country got legal rights over 1.7 million ha, an unprecedented achievement. Most of them got legal right over their land for the first time. In contrast, under the much hyped land reforms programme, the government distributed only 2.2 million ha to 5.64 million families in the past six decades. “If FRA is converged with government schemes, as the Act provides, and worked properly upon for at least five years, the economic condition of tribals will change drastically,” says Giri Rao of Bhubaneswar-based non-profit Vasundhara, which tracks implementation of FRA in the state. A rough calculation shows that each title holder should have access to 56 government schemes covering land development, subsidised homes and government’s foodgrain procurement programme. “This priority convergence with government programmes makes the right an effective livelihood programme,” says N C Saxena, chairperson of the National Forest Rights Act Committee set up by the Centre to examine the implementation of FRA in 2010. But the question is: have people reaped the benefits of FRA? The economic boom that these villages of Odisha are experiencing should have become a reality in 170,000 villages across the country. The environment ministry’s India Forestry Outlook study for 2020, published in 2009, estimates that 20 per cent of the forestland under government control would be with people once the Act is fully implemented. This is more than 15 million ha forestland. As many as 31 million ha forestland is used by villages, estimates Forest Survey of India. But the Act’s development potential has been least exploited (see ‘Not implemented, not converged’). Of the 19 states that have state action plans to implement FRA, none has taken up full scale convergence programme. In neighbouring Samaiya village, Chotelal Saiyam’s 4.4 ha family land was split among three brothers when they got land rights. “When the entire family shared land, some would look after agriculture and others would collect forest produce. Collectively, we managed a decent living. Now each family has to look after its own piece of land. Income from forest produce has fallen,” he says. But the government has a long list of convergence work done in the state. Ashish Upadhyay, former commissioner, tribal development, who was transferred recently, says 70 to 80 per cent of the beneficiaries have been issued Kisan Credit Cards, with loans facilitated through cooperative banks. Till March 2013, as many as 54,000 houses have been sanctioned under Indira Awaas Yojana, 10,000 wells have been sanctioned under MGNREGA, and 20,000 motor pumps given under Central assistance scheme for tribal development. This apart, 7,000 land levelling jobs have been completed. For the government, handing over land titles is the easiest step in implementing FRA. The tough task is officially changing the land’s regime. As per FRA, all forest villages, unrecorded settlements and old habitation must be converted to revenue villages. Notably, despite decades of efforts India still does not have proper records of lands. “New titles must be recorded in government’s land records. Without this, title holders’ ownership will not be recognised,” says Sanjay Upadhyay, environment lawyer and former legal consultant with the Ministry of Tribal Affairs (MoTA). “But no state has recorded fresh land titles in its revenue record. Hardly any forest village has been converted to revenue village. Everything is on paper, nothing has changed on ground,” says Upadhyay. “Our village does not have an irrigation tank,” says former sarpanch Ganesh Taram of Rampuri village in Maharashtra’s Bhandara district. “We urgently need wells to sustain paddy crops when there is little rain.” With their titles not registered in revenue records, they cannot avail government schemes. “This year we suffered huge losses due to heavy rains, but in absence of records, we are not eligible for government aids,” he says. “According to revenue records, government is the owner of my land, not me,” says Vasudev Meshram of Jambhli village in the same district. “When I showed the document at the paddy procurement cooperative of the tribal development department, I was refused membership.” The state government has not demarcated his land on ground. Meshram is lucky to have the revenue record. Most of the 50 families in his village do not have their revenue records at all, though they received land claims under FRA in 2010. In many states, convergence work has not started because of the absence of government guidelines on the process of issuing revenue record documents, says K V Dhurve, chief coordinator, forest rights, tribal development department, Maharashtra. It is not clear whether the document is to be issued in the owner’s name or the government’s, he says. In Madhya Pradesh and Odisha, revenue and forest departments are in conflict over the status of forestland. Dispute over land ownership between revenue and forest departments is a big hurdle in the implementation of FRA. Neither the state governments nor the Centre is clear about the process of recording the rights and status of land after handing over titles. In 2011, when Madhya Pradesh raised doubts over the process of recording rights and the administration of FRA land post-settlement, MoTA said it was to be done as per the settlement rules of each state government and left it to them to decide it. A senior MoTA official admits correction of land records is tricky. “Every state has a different setup for maintaining land records, so each state will have to find its own way of recording the rights. The Centre cannot prescribe a uniform format,” the official says. FRA a mere electoral issue? The Central and state governments had electoral interests in FRA. The Act came into force in 2007, two years prior to general elections. In Maharashtra, most titles were given in 2008-09, says Pratibha Shinde of state-based non-profit Lok Sangharsh Morcha. “Now that the Lok Sabha elections are scheduled for April next year, people will start getting titles again,” she says. 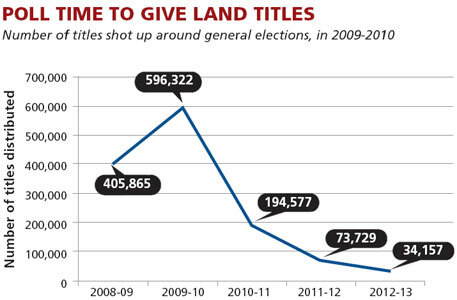 Countrywide, most titles were given between 2008 and 2010, the period when major forest-bearing states went to polls (see ‘Poll time to give land titles’). Andhra Pradesh started preparatory work for implementation of FRA in 2007 and formed an action plan almost immediately after the Act came into force. It decided that the mandatory forest rights committees (FRCs) should be formulated within a month, claims should be received within five months and all title deeds should be distributed by October 2008, just before of the general elections. The state officials were forced to speed up survey, verifications, mapping and identification of the land. By September 2013, the state rejected close to 60 per cent of the claims. Now, hardly 40 per cent of its villages are covered under FRA. After the initial euphoria, FRA is in a state of inertia. Most of the 1.3 million individual titles issued were processed by June 2011. But since then, only 0.1 million individual titles have been issued. Ten states and union territories have not given a single land title. These are: Tamil Nadu, Uttarakhand, Arunachal Pradesh, Nagaland, Mizoram, Manipur, Meghalaya, Goa, Daman and Diu, Dadar and Nagar Haveli (see ‘Not roadblock, it’s lack of state’s will’ on facing page). Odisha, which has given the country’s highest number of land titles, has done much less than its potential. 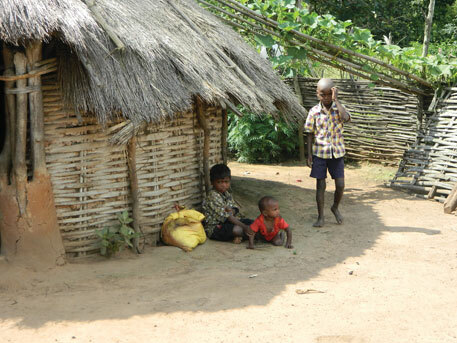 In January 2010, the state’s Scheduled Cast and Scheduled Tribes welfare department stated that at least 0.74 million tribal families in the state should benefit from FRA. So far, only 0.32 million families have got titles. In April 2009, the Madras High Court gave the state government go-ahead for the implementation of the Forest Rights Act (FRA) in V Sambasival v Ministry of Tribal Affairs (MoTA) case. The order also stated that the court’s permission should be sought before land titles are distributed. It took the state government two years to move the court for permission to distribute 2,312 titles. In April 2010, the court ordered the petitioners to verify if the claims were correct. Three years later, nothing has happened. N L Rajah, advocate for MoTA in the case, says petitioners have questioned the absence of gram sabha participation in the claims approval process. “Government is yet to formulate an answer to this submission,” he says. “Restrictive orders similar to that of Tamil Nadu’s were also issued in Andhra Pradesh and Odisha, but they were vacated long ago,” says C R Bijoy of forest rights forum Campaign for Survival and Dignity. “Tamil Nadu government has not taken necessary steps to get the order vacated,” he says. Of all the excuses presented by the state governments, Uttarakhand’s is flimsiest. MoTA’s status report on FRA implementation shows the government carried out the process of constituting forest rights committees (FRCs) in the state. But the same report states constitution of FRCs was delayed. It cited model election code of conduct as the reason for the delay. The report does not even give the years when the work was held up and what happened in the remaining years. The state has processed only one claim till now, which too it rejected. What’s more, state governments rejected more than half of the 2.8 million title claims processed countrywide (see ‘Land people use, but have no rights’). Of the 345,975 claims made at the gram sabha level in Maharashtra, only 109,458 were accepted. A whopping 233,689 were rejected. In Bhandara district, only about 30 per cent of claims were accepted, says Manish Rajankar of non-profit Nisarga Sewa Mandal. MoTA’s status report on the implementation of FRA show most of the rejections were by sub-division and division level committees, which overruled gram sabha decisions. “In most cases, no reason is given for the rejections. 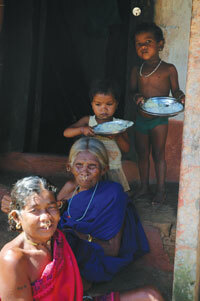 Claimants are not given the opportunity to appeal against it,” says Bidyut Mohanty of Koraput-based non-profit SPREAD. Some people have complained that they received titles for much less land than what they claimed. FRA provides recognition of land up to 4 ha to each legitimate claimant. But the average size for which titles have been granted is only 1.4 ha. “So those who cultivated large farmlands, now face the prospect of reduced income from agriculture,” says Mohanty. MoTA, which supervises FRA’s implementation, is grappling with this situation created by state governments. Analysis of action plans of 19 states shows that all the states set ambitious targets and deadlines to implement FRA. The rush in clearing claims has led to hurried and whimsical decisions. “The situation is such that there are more rejections than acceptance of claims,” says tribal affairs minister Chandra Kishore Deo. The National Forest Rights Act Committee pointed out this faulty implementation of FRA in January 2011. It noted that institutions not constituted as per the law and faulty ways of processing claims are the major hurdles in FRA’s implementation. “At present, there is no state-level institution to effectively monitor FRA’s implementation,” says tribal affairs minister. 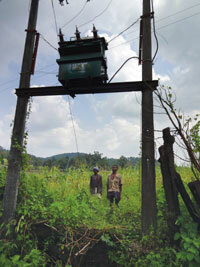 In many states with high forest cover, the basic administrative step of forming village FRCs has not started. In Madhya Pradesh, Chhattisgarh, Andhra Pradesh and Maharashtra, FRCs have not been constituted in close to 40 per cent of villages. “In villages where FRCs have been formed, gram sabhas have not convened,” says C R Bijoy of Campaign for Survival and Dignity, a forum of non-profits. “The entire FRA process is undertaken mostly at places where civil society organisations are active. In many villages, people do not even know the provisions of the law,” says Neema Pathak Broome of non-profit Kalpavriksh. In Andhra Pradesh’s Adilabad district, residents of Chinnaharadapalli village are unaware of the forests rights legislation. The village of Naikpod tribes, heard about FRA only when Down To Earth asked them their experiences with the Act. “Nobody came here to tell us about it,” says resident Chandi Rajaiah. At present, Andhra Pradesh plans to purchase more GPS equipment and train surveyors to measure land effectively, says Somesh Kumar, commissioner, tribal welfare department. But to start this the state must first straighten its messy land records. “The state cannot implement FRA effectively unless it settles boundary disputes with the revenue department,” says Sagari R Ramdas of Hyderabad-based non-profit Anthra. Deepak Margade of non-profit Manavi Hakka Sangharsha Samiti and resident of Gondia distrct in Maharashtra, says government should set deadlines for land measurements and revenue records after the title certificates are given. No record has been made even for claims issued as early as 2009. “It is important that every record is not only verified on ground but also reconciled with both forest and revenue records,” say MoTA officials. Are there legal hurdles in doing so? There was confusion over what would be the legal status of land recognised under FRA. “There are no legal requirements as such,” says Sanjay Upadhyay. “The status of the land does not have to change from forest to revenue. What the states have to do is correct their forest and revenue records as and when the titles are given. The simplest thing is to add a new column in the revenue records to acknowledge FRA titles, the way it is done in Uttar Pradesh. Once this is done, an operational mechanism for convergence of various schemes can be successfully brought in,” he says. So far, only Uttar Pradesh has the mechanism to record rights. For the FRA titles granted on forestland, funds for development schemes will be channelised through the forest department. So activists fear that the forest department will still control decision making on FRA land. Tushar Dash, researcher with Vasundhara, suggests that changes should be made at the policy level so that the funds are channelled directly through gram sabhas. “For this, MoTA will have to actively engage with the ministries of environment and forests, panchayati raj and rural development to evolve a new institutional mechanism for convergence on FRA land. MoTA has not addressed this long-pending requirement,” he adds. In September 2012, Mota amended the Act giving more authority to gram sabhas and curtailing the role of forest departments in the Act’s implementation. The ministry also threw its weight behind recording of rights. The new rule mandates that after the titles are issued, maps of the forestland vested under FRA should be prepared and rights be incorporated in the revenue and the forest records within three months. Most states promised to review the rejected claims, recognise community forest rights, habitat rights of particularly vulnerable tribal groups, and rights of pastoralist communities under the Act in a time-bound manner. But in one year, not much has changed. “Politics plays a major role in FRA’s implementation,” says Shinde of Lok Sangharsh Morcha. 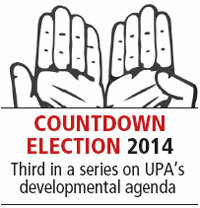 The renewed enthusiasm is because of the coming Lok Sabha elections and Assembly elections in the major forested states. “There is no political and bureaucratic will to push for FRA. Had this not been the case, forestlands would not have been diverted for industries so easily,” says a senior advisor to MoTA. Clearly, there is a long way to go before anything resembling land security becomes a reality in the country. This northeastern state has earned a remarkable feat in implementing the Forest Rights Act (FRA). Government data shows that 28 per cent of the total forestland has been entitled to people. L H Darlong, director, state tribal welfare department, says the state government has given 176,000 hectare (ha) forestland to 120,000 forest dwellers. The problem is, close to 60 per cent of the land deeds have not been demarcated on ground. Result: despite getting claims, people do not know their exact land location. Before elections, the state government had given land entitlements to 100,000 people. Now government officials have raised doubt over the credentials of these beneficiaries. 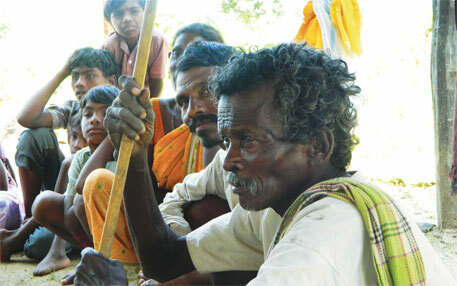 Most of the land has been given to the Jhumia tribals, who live in forests and practice slash and burn method of agriculture. However, the forest department data shows the state has only 27,700 Jhumias. The government wants people to use the land for bamboo and rubber plantation. But it doubts the productivity of the land. “All productive land is given to towns and cities for development. Second best quality land is used for agriculture. The worst plots are for forestation. We are trying to ensure livelihood to people with the land that has no productive capacity,” Darlong says. How do you expect their lives to Change ? The Act is Conceptually flawed. It reduces tribals to anthropogenic specimens who can meet their ends in jungles while to world changes around them. Rights have no meaning without the opportunities to exercise them and the proponents of this act will eventually realize that it has not only done nothing to improve tribal livelihood but has also led to the destruction of precious little forest Cover that is left in the country. Without the opportunities to invest in their future tribals are being forced to just make their ends meet using their so called "rights" while the real beneficiaries Loggers, Smugglers and traders from towns reap profits.